Dinner can be hard to get together some nights. I combined #SuccessRice with almonds and served it with Yogurt Marinated Chicken for an easy dinner! I love to cook. That is probably pretty obvious if you hang out around here. I am always looking for new ideas and recipes to share with my family. One staple most of our family meals have in common: rice. BUT, having two kids and a full time job means I don’t typically have time to cook rice the standard way. Mathlete also prefers when I cook with as few tools as possible to limit the number of dishes he has to clean up. I recently had the opportunity to try Success Rice when making a new recipe for my family: Yogurt Marinated Chicken with Almond Basmati Rice. Now, before you look at that and think “there is no way that is a weeknight meal”, let me stop you. This meal comes together so quickly! The only thing that takes any real time is marinating the chicken and you can do that while you sleep or work! This chicken kabob marinade looks like it takes a lot of work, but all the ingredients get mixed together and combine to make an explosion of amazing flavors! You can even have basmati rice with this thanks to the variety of flavors of Success Rice which boil in right in the bag. No measuring or anything so you are free to focus on the other parts of the meal. What is one of your meal staples? Have you ever tried boil in bag rice? Start by cutting your chicken breast into bite sized pieces for kabobs, but if you want to skip this step just be sure to adjust the meat cooking times below to account for the larger pieces of meat. Mix together yogurt though pepper and stir well. Stir in the 1/4 cup of olive oil until complete mixed. Add chicken to a ziploc bag or large bowl. Pour marinade on top of chicken and toss to coat well. Toss vegetables with 2 Tbsp of olive oil. Thread vegetables and chicken pieces onto skewers. While the kabobs cook, prepare the rice according to the directions on the package. Basically pot of boiling water + bag of rice = couldn't be easier to make perfect rice in under 10 minutes! Toast sliced almonds in a small pan over low heat, stirring occasionally, while the rice is cooking. Mix almonds with cooked rice. 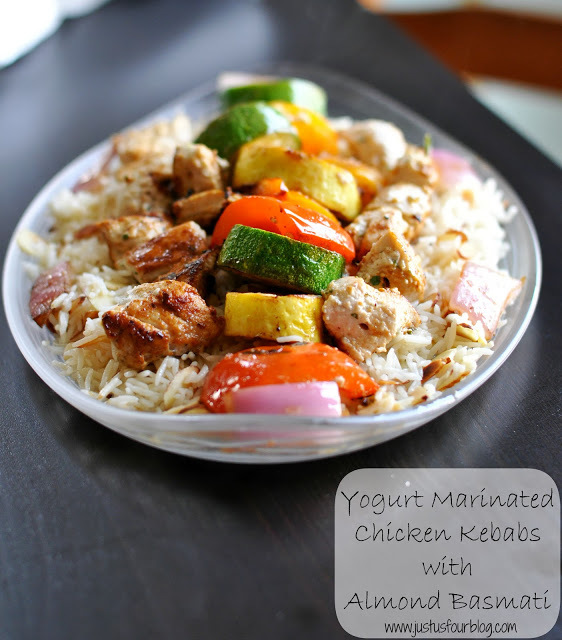 Serve kebabs on top of the almond basmati rice. Start by cutting your chicken breast into bite sized pieces. I did this because I wanted to cook my meat and vegetables as kababs. Stir in the ¼ cup of olive oil until complete mixed. Cook over medium heat on grill, turned occasionally, for 7-10 minutes or until done. While the kebabs cook, prepare the rice according to the directions on the package. Basically pot of boiling water + bag of rice = couldn't be easier to make perfect rice in under 10 minutes! Awesome recipe! That sounds delicious. I have never marinated chicken in yogurt before, great idea! Marinating chicken in yogurt makes it so tender and delicious. Give it a try and let me know what you think! Yummo…this looks so delish! I love marinated chicken and so I’ll have to give this recipe a try! I am co-hosting a party with 3 other bloggers called The Project Stash and it is starting tonight at 8:00 pm EST. I’d love for you to stop by and link up your project! There is also a Shabby Apple Giveaway! Thanks! I love marinating chicken in yogurt because it makes it so tender. Thanks so much for stopping by! This looks so yummy and flavorful! Thanks! This is such a favorite in our house now. Looks yummy!! Thank you for sharing at Give Me The Goods! Thanks so much for having such a great party. Thanks! It is definitely one of my favorite dishes. This looks great! I love the idea of marinating in yogurt! Yum! !